Jeffinous: What is Fairy Retaining Skirt? What is Fairy Retaining Skirt? Fairy Retaining Skirt, 留仙裙 was actually a part of the skirt hem that was deliberately made missing. It is commonly misunderstood that the term refers to the multitudinous creases on the hem of the skirt. 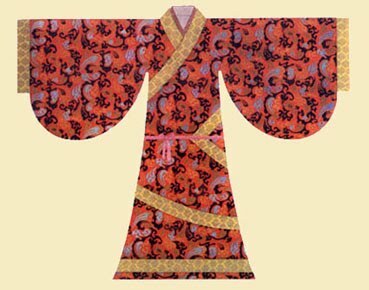 This fashion of having a torn hem was very popular during the reign of Emperor Cheng of the Han Dynasty (漢成帝) . According to legend, Zhao Feiyan (趙飛燕) was dancing on a giant platform made from boats lined up together on the imperial lake when a huge gust of wind blew across it. With her broad sleeves fluttering in the wind, she looked like a fairy about to take flight. The Emperor was so concerned that she would be blown away that he ordered the imperial court musician who was closest to her to grab hold of her. However in midst of haste he grabbed the hem of her skirt and torn part of it off. 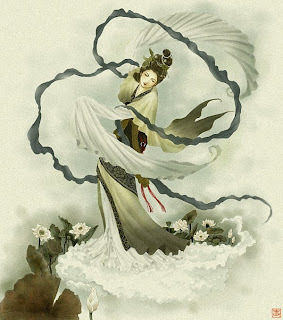 At that moment, Feiyan cried out in a mellifluous voice exclaiming to the Emperor that had he not ordered someone to grab hold of her; she would indeed be blown away and turned into a fairy. As she continued to dance, she indeed looked like a fairy descending from the heavens; with the flaw magnifying her beauty. Soon every palace lady tore off a piece of their skirt hem in imitation and thus the term fairy retaining skirt was born. 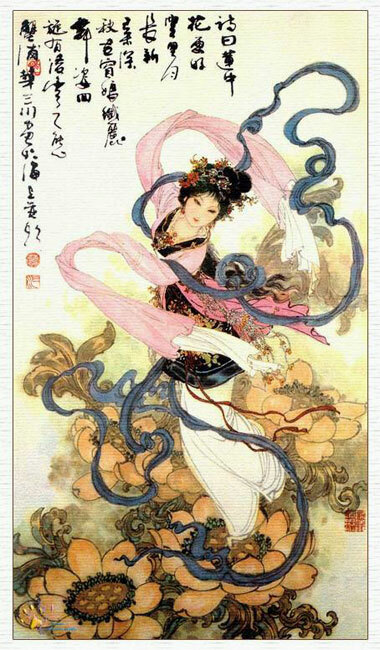 Later, the Emperor built a “Seven Precious Wind Evading Terrace” (七寶避風臺) for her to dance without the fear of her being blown away. Another term used to describe her beauty was “Dancing on Palms” (掌上舞). It was believed that she was so slender and has such small feet that she could dance on the palms of hands. In actuality, it was a carved crystal plate carried by attendants while Feiyan was dancing on it. Another favourite of hers was to dance on a platform supported by musically sized hollow vessels. Indeed her name was changed to flying swallow because of her daintiness. Who was this Zhao Feiyan? Once upon a time she was a sandal maker, going through abject poverty. Later, she and her sister Hede were adopted by a rich man who saw their beauty and trained them in the arts of music, painting and pleasing the man. 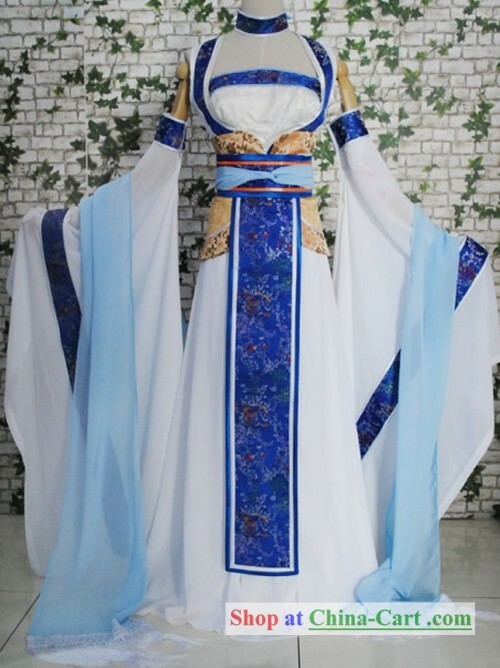 He was not disappointed in his investment as she became an attendant to the Emperor’s sister and from there rose in status to become his imperial concubine and in then end, the Empress after the Emperor demoted his Empress after being accused of some crime with another former favourite. The dethroned Empress’ life was spared because no proof was found. The other former favourite was shrewder. She refused to return to her former status but as a maid-in-waiting to the Emperor’s mother, the Empress Dowager. Later, Fei Yan's younger sister, Hede was introduced to the Emperor as a means to protect her status from other rivals. Despite of their beauty and being the favourites of the emperor, they did not conceive. It was rumoured that they used some kind of aphrodisiac to put on their navels. As it dissolves, their bodies would exude fragrance and their skin became smooth and delicate, never to age. However it had a great side effect – reproductive systems were destroyed. Records indicate there were several attempts by imperial physicians to find a cure for them. There was even a story that her grave was robbed in order to secure this beauty enhancing secret. However, only most of the ingredients recorded on bamboo slips were decayed and only visible ones were 麝香, musk. Feiyan became Empress Dowager when the Emperor died suddenly. Rumours abounded that her sister Hede had overdosed the Emperor with aphrodisiacs. Finally she committed suicide when an investigation was ordered by the Grand Empress Dowager to find out the validity about rumours that the dead Emperor had sons born by other concubines. Perhaps she was too frightened about her future when it was concluded that two infant sons died with tacit approval from the Emperor so as to please the sisters. Feiyan’s new position did not last long. When the second next emperor mounted on the throne, she was demoted back to Empress and not long afterwards she was stripped of her nobility and made a tomb server to her husband’s mausoleum. She committed suicide due to loneliness. Of course we never know the truth as her mother-in-law never liked her in the first place because she was not noble-born. Yang Gui Fei – the favourite of the Tang Emperor Hsuan Tsung was often compared with Feiyan not because of their facial beauty but for their relative sizes – plumb Yang and slender Swallow; unflattering terms for the two ‘evil’ beauties – fat Yang and skinny Swallow.